Fill a large saucepan with 2-3 inch of water and bring to a boil over high heat. Reduce the heat to medium-low, pour in the vinegar and 2 tsp of salt, and keep the water at a gentle simmer. 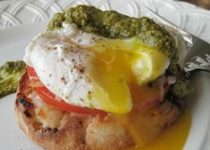 While waiting for the water to simmer, place a slice of mozzeralla cheese and a thick slice of tomato onto each English muffin half, and toast in a toaster oven until the cheese softens and the English muffin has toasted about 5 min. Crack an egg into a small bowl. Holding the bowl just about the surface of the water, gently slip the egg into the simmering water. Repeat with the remaining eggs. Poach egg until the whites are firm and the yolks have thickened but are not hard, 2 1/2 to 3 min. Remove the eggs from the water with a slotted spoon , and dab on a kitchen towel to remove access water. 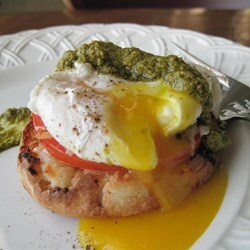 To assemble, place a poached egg in top of each English muffin. Spoon 1 tsp of Garlic Scape pesto onto each egg and sprinkle with Garlic Scape sea salt to taste.